In this game there are numerous fruits and veggies which will make this an amazing match game. There are fruits and veggies like strawberry ,corn ,pumpkin ,tomato and others which are dazzling on gameplay. In Farm puzzle : Harvest king there are different objective at each level. one level is completely different from another level. The objective of this game is to switch and swap to make a perfect match of 3 or more fruits or veggies in this farm game. Splash yourself in this farm puzzle game. Make party with these colourful and funny strawberry, corn ,pumpkin,tomato and others. In this wonderful journey of farmland you will become Harvest King with regular practice. 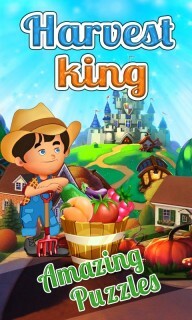 Farm Puzzle : Harvest King is a swap game of matching fruits and vegetables. 1. 100 levels of exciting game. 2. Fruits and vegetables like strawberry ,corn ,pumpkin ,tomato. 4. Discovering and exploring adventure with different fruits. 5. Fun and easy to play. Download Farm puzzle : Harvest king today and enjoy your time with this amazing match 3 game!